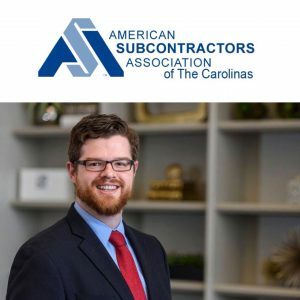 Anderson Jones Attorney Daniel Knight will be presenting Collection Toolbox to the Triangle Chapter of ASAC at David Allen Company in Raleigh on Tuesday, September 11th at 11:45am. Tips & strategies to help you get paid on your projects. Contact Alicia Lewis at 919-277-2541 or alewis@andersonandjones.com for registration details.